If the Capital One Mascot Challenge comes down to who can best throw their hands in the air and wave’em like they just don’t care, Aubie’s got this. 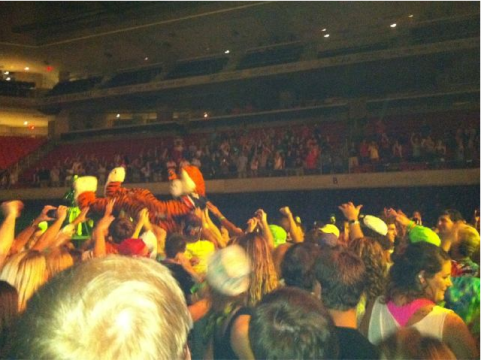 His appearance on stage—and then on the crowd—during Girl Talk’s performance was by all (Twitter) accounts one of the highlights of last night’s UPC Fall Concert at Auburn Arena. Also, if considerations of OCD-related disorders like kleptomania factors into the vote at all, that’d be good, too. UPDATE: … and we have video. This one gets up close and personal at :27.